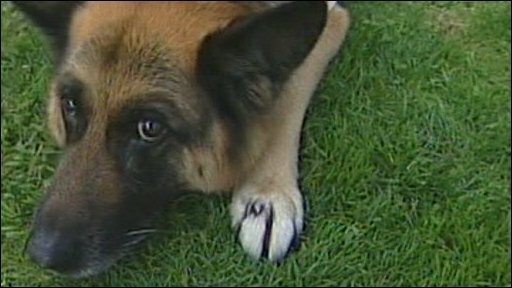 A dog which was pulled from a house fire in Cornwall is being treated with honey pads to help heal her wounds. Lady, the alsatian was found stuck under burning ceiling tiles after the fire at her owner's home near Stithians. The treatment of eight-year-old dog, who suffered severe burns down one side and on her back, includes pads impregnated with manuka honey. Owner Cyril Bond, 77, said her condition had improved because of the treatment. Lady was trapped for two hours before fireman rescued her from the burning building. Mr Bond said he was given the good news that she survived after he was taken to hospital. He said: "One of the nurses came over and said the police had been on the phone to say the fire brigade got her out and she was on oxygen." She is thought to have survived because she found an air pocket. As part of her treatment, which has been ongoing for several months, her bandages which contain honey-coated dressings, are replaced several times a week. Vet Amanda Manley, who works at the Cornwall Animal Hospital, said she believed the honey had greatly improved Lady's condition. "I'd like to say it's all down to the honey, but to make a proper judgement you need to have a scientific control. "But I'm very impressed and I'd use it again in this situation." The honey is produced by bees feeding on the Manuka bush, which mainly found in New Zealand. Manuka dressings for wounds were licensed for use in NHS hospitals in 2004. Background/aims: We evaluated the effect of oral usage of honey and pollen, either separately or together, on postoperative intraabdominal adhesions. Methods: Forty rats were randomly separated into 4 groups of 10 rats each. Abrasion was performed on the cecum, and a patch of peritoneum located opposite to the cecal abrasion was completely dissected. Group 1 rats received no treatment; Group 2 rats received 4 g/kg/day honey; Group 3 rats received 4 g/kg/day pollen; and Group 4 rats received 4 g/kg/day honey and pollen mixed in equal amounts, in addition to the standard feeding for postoperative 21 days. All the rats were sacrificed on the 21st day. Following the adhesion scoring, tissue specimens of the peritoneum and bowel were subjected to histopathological investigation. The tissue and blood specimens were also taken for biochemical analysis to investigate the antioxidant capacity. Results: Adhesion scores were significantly different between the control and other groups. No dense adhesion was observed in the treatment groups. Tissue malondialdehyde levels were significantly different between the control and honey and honey+pollen groups. Superoxide dismutase and glutathione-peroxidase levels were significantly different between the control and other groups. Catalase levels were different between the control and honey groups. Plasma antioxidant levels were different between the control and other groups. The pathological scores for fibrosis and inflammation were significantly different between the control and other groups. Conclusions: Honey and pollen were found to be effective in preventing postoperative intraabdominal adhesions, and these effects were thought to be a result of their antiinflammatory and antioxidant properties. "Two experiments were carried out. In immune response test, the immune enhancement of propolis, oilemulsion and aluminium salt were compared in guinea pig vaccinated with inactivated porcine parvovirus (PPV) vaccine. The result showed that three adjuvants could enhance antibody titer, T lymphocyte proliferation, IL-2 and IL-4 secretion of splenic lymphocyte. The action of propolis was similar to that of oilemulsion and superior to that of aluminium salt, especially in early period of vaccination propolis could accelerate antibody production. In immune protection test, the effects of three adjuvants on PPV infection were compared in guinea pig vaccinated with PPV vaccine then challenged with PPV. The result showed that propolis and oilemulsion could enhance the antibody titer, IL-2 and IL-4 content in serum and decrease the PPV content in blood and viscera. In the effect of improving cellular immune response, the propolis was the best. These results indicated that propolis possessed better immune enhancement and would be exploited into a effective adjuvant of inactivated vaccine." To study the antimicrobial activity of honey, 60 samples of various botanical origin were evaluated for their antimicrobial activities against 16 clinical pathogens and their respective reference strains. The microbiological quality of honeys and the antibiotic susceptibility of the various isolates were also examined. The bioassay applied for determining the antimicrobial effect employs the well-agar diffusion method and the estimation of minimum active dilution which produces a 1 mm diameter inhibition zone. All honey samples, despite their origin (coniferous, citrus, thyme or polyfloral), showed antibacterial activity against the pathogenic and their respective reference strains at variable levels. Coniferous and thyme honeys showed the highest activity with an average minimum dilution of 17.4 and 19.2% (w/v) followed by citrus and polyfloral honeys with 20.8 and 23.8% respectively. Clinical isolates of Staphylococcus aureus subsp. aureus, Escherichia coli, Salmonella enterica subsp. Enterica, Streptococcus pyogenes, Bacillus cereus and B. subtilis were proven to be up to 60% more resistant than their equal reference strains thus emphasizing the variability in the antibacterial effect of honey and the need for further research. The therapeutic effects of Argentine propolis ear drop formulation on canine otitis externa were evaluated. Forty-eight dogs with symptoms of otitis externa were randomly assigned to double-blinded, controlled clinical trial to evaluate the efficacy of topical formulation with propolis versus a topical placebo in the treatment of otitis externa. The propolis preparation and placebo were administrated into both external ear canals, twice daily for 14 days. Throughout the study, clinical examination and microbiological analysis of dogs ear exudates were made. The most frequent microorganisms isolated in culture media were: Malassezia pachydermatis (54.2%), Staphylococcus aureus (43.8%), coagulase-negative Staphylococcus (25.0%), Pseudomonas aeruginosa (20.8%), Candida albicans (18.8%), Proteus mirabilis (16.7%), Streptococcus spp. (16.7%), Enteroccocus faecalis (12.5%), Escherichia coli (12.5%), Staphylococcus intermedius (6.3%), Klebsiella spp. (4.2%), andCandida glabrata (2.1%). Whereas the control group did not recover from the infectious ear disease, the propolis preparation exhibited antimicrobial activity against most of the microorganisms isolated from samples of the treated group. In addition, no propolis-adverse effects were observed. This allowed propolis-treated patients to show a significant improvement of the clinical parameters. Thus, this new Argentine propolis ear drop formulation may be used for topical treatment of otitis externa in dogs. I've read of royal jelly's beneficial effects on bone and tissue healing. So, this is additional justification to consuming more bee products simultaneously! Propolis is a substance of honeybee origin with known antioxidant effects. The purpose of this study was to examine the effects of propolis on fracture healing and the antioxidant system in an experimental setting. Thirty-two rats that underwent experimental femur fracture and then fixation were randomly allocated in one of four groups: two control groups (Control-3w and Control-6w) and two treatment groups (Propolis-3w and Propolis-6w). Treatment groups received propolis until killing (at 3 or 6 weeks). X-ray, histological, bone mineral density measurement findings and endogenous antioxidant levels were examined. The bone mineral density was higher, radiological and histological evaluation scores were better, and superoxide dismutase, total glutathione and myeloperoxidase levels were lower among the rats that received oral propolis treatment compared with the controls. In addition, bone mineral density and histological assessment scores showed time-dependent improvement in the treatment group. In conclusion, the findings of this study suggest that propolis has some time-dependent beneficial effects on fracture healing. This has been reported anecdotally for over 20 years. It's good to get some precision. "Previous works... revealed that propolis has synergistic effects with antibiotics, acting on the bacterial wall and ribosome..."
Propolis is a honeybee product that has been used since ancient times because of its therapeutic effects. It can be used in the development of alternative therapies for the treatment of many diseases, and because propolis shows antibacterial action, this work was carried out in order to investigate a possible synergism between propolis and antibiotics acting on DNA (ciprofloxacin and norfloxacin) and on the metabolism (cotrimoxazole) against Salmonella Typhi. Propolis samples collected in Brazil and Bulgaria were compared in these assays, and the synergism was investigated by using ½ and ¼ of the minimal inhibitory concentration for propolis and antibiotics, evaluating the number of viable cells according to the incubation time. Brazilian and Bulgarian propolis showed antibacterial activity, but no synergistic effects with the three tested antibiotics were seen. Previous works by our laboratory have revealed that propolis has synergistic effects with antibiotics, acting on the bacterial wall and ribosome, but it does not seem to interact with antibiotics acting on DNA or folic acid, and only a bacteriostatic action was seen in these assay conditions.